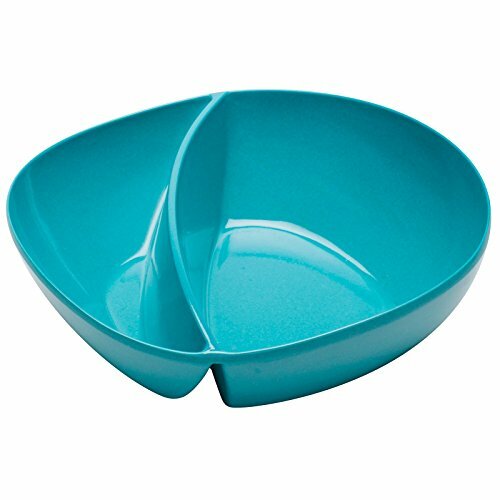 Say hello to stylish, eco-friendly dinnerware with the Zak Designs Moso 10.5 in. Divided Plate - Set of 6. Perfect for those who cannot abide the touching of foods and mingling of flavors (or those who like dessert and dinner on one plate), this set is crafted with 75% renewable bamboo. The colorful high-gloss finish lasts longest when you hand wash. BPA-free and ideal for college students and busy families. Not recommended for microwave use. About Zak Designs Zak designs has been putting the quirk back in cooking for over 30 years. Using a keen sense of current style trends, Zak Designs develops tableware, dinnerware, and kitchen prep products that make a statement. Meals are never more fun than when they're served or prepped using Zak Designs products. Set of 6 biodegradable bamboo plates. Glossy finish in your choice of color. BPA-free 2 section plates. Hand-wash and do not microwave. Dimensions: 10.56 diam. x 1H in..
Set of 6 biodegradable bamboo plates Glossy finish in your choice of color BPA-free 2 section plates Hand-wash and do not microwave Dimensions: 10.56 diam. x 1H in.